Nooks primarily serve as Barnes and Noble’s e-readers even if the availability of Android and Google Play expands their capabilities. They might have sold a few if they’d introduced it last week. Maybe the slowboat from China got caught in the Great Pacific Garbage Patch? An ‘everything but a phone’ with “up to seven hours of battery life”? When it comes to cheap android tablets, the devil is usually in the details somewhere. I wouldn’t expect it to be very good unless they are selling it at a significant loss. Not necessarily. The quality of cheap tablets has gone up a lot over the years. Amazon’s Fire 7 has nearly the same specs, and is regularly on sale for $30 to $35. I bought one three years ago for $33, and it’s still working well. The new Nook has 8GB more storage, but the price of flash memory is in freefall right now, so that probably doesn’t add much to the cost. The Amazon $49 Fire is an excellent general purpose small tablet. Maybe there are some nasty details hidden somewhere, but I haven’t stumbled over them. Two years, and running strong. Amazon’s Fire 7 tablet, normally $49.99, was on sale Black Friday at the Amazon Kiosk at the local mall for $29.99. So I bought one. Specs are very similar to the Nook 7 discussed in the OP. Too bad B&N didn’t offer this Thanksgiving weekend. They might have sold a lot of them. As it is, too little, too late. But that seems to be B&N’s SOP. Of course, your $29.99 tablet comes with ads that require another $20.00 to disable, bringing the non-ad price back up to $49.99 – $69.99 if there had been no discount. The Nook tablet is comparable (which isn’t saying much) and is $49.99 straight up, with Google Play store rather than the crippled Amazon store. This would be very competitive if they had done it a few years ago. Now, all it shows us is that they’re gonna go down fighting. I didn’t realize that the Google Play store had a better selection of trad-pub and indie ebooks for this ‘kindle competitor’ than Amazon. Sorry, Google Play vs Amazon for App selection, not book selection. I agree, for books it’s Amazon, hands down, but you don’t miss the Google Play store until there’s something you want on your tablet that’s just not in the Amazon App store. I have a Kindle with those ads. They are just a screen saver. No ads appear anywhere else. I think the alternative screen saver you get for the extra $20 shows a couple of book-ends. Twenty dollar book-ends? But, the ads are targeted to me. I like them because they lead me to good books. If I had an on/off switch to control the ads, I’d keep it on. More discerning readers than I probably get ads for high-brow stuff. The ads reflect what you read. Terence, I assume that you are talking about a Fire rather than an e-reader? It certainly sounds like it’s not worth paying to get rid of special offers. I had a Paperwhite with special offers and it stole space on the home page so I paid up to get rid of them and have done the same for all subsequent devices (at £10 it’s cheaper in the UK). This was some time ago before what I think is now called home screen view existed, something I always have turned off. You’ve now got me wondering where the ads would appear if I hadn’t paid up? Felix, thanks for the images. The first is what I paid £10 to get rid of. It reduced the number of collections shown per page and as I have about 80 collections on my devices (plus a few more that are kept hidden as they are for my wife) I resented even this small loss of data. The second is the screen I turn off as soon as I get a new Kindle. I get plenty of book suggestions from Amazon in other ways and really don’t need these extras. The ads on my 2yo Paperwhite are book ads. They’ve got a screensaver, and, at the bottom of the homepage (where you access the library and can see the status of your device, etc), is a line of books that I may be interested in at the bottom of the page. It is, as mentioned above, a better list of suggestions than I expected, and I actually have gotten a book or two from that list. Really, they’re quite unobtrusive overall, and not bothersome, mainly because they’re for an item I’m interested in browsing for anyway. Plus, the Paperwhite isn’t backlit like tablets are), which makes reading more comfortable; it’s far lighter than a tablet, and smaller, which makes it easier to hold; Amazon offers a wider selection of books than B&N does; and the battery life is far better than the B&N tablet. Terence, I assume that you are talking about a Fire rather than an e-reader? I have the Kindle. I don’t know it’s name, but it cost $89 last year. I don’t even know what the home screen is. I just scroll the library, download from my purchases, and read. I always purchase on a laptop. Personal preference. 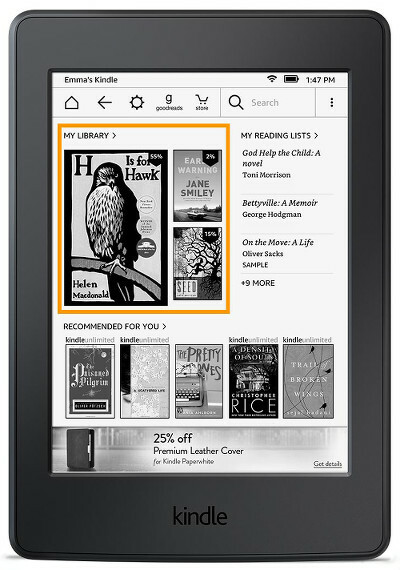 Buyers should make sure they can install Kindle or Kobo apps without any difficulties. Unlike rival Amazon, Barnes & Noble made almost no modifications to the version of Android running on its tablet. Aside from a few ebook applications and widgets tied into the B&N ecosystem, this is a stock version of Android 6.0 Marshmallow, with full access to the Google Play store for apps, ebooks, etc. Complete support for Chromecast is even included. The application for reading Barnes & Noble ebooks is quite usable. Font sizes can be adjusted, as can margins and text justification. The color of the background can be changed, but this app doesn’t yet support filtering out blue light to help readers fall asleep. The only real flaw in this system is that one cannot download any ebook without a credit card. Just trying the apps out with free titles requires typing in a credit card number. Looks like a great tool for buying books from Amazon, especially if the Kindle app has all the integration features with the Audible app. That review is for the older 2017 8GB model not the new one with 16GB. They were comparing it to the 2016 Fire Tablets, which were replaced a few months later. It looked like a good tablet at first. Then they found they shipped with factory fresh malware and exploding charger. One would hope the new one doesn’t.